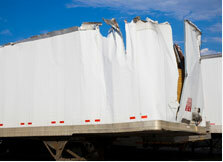 At Bellotti Law Group, P.C., we see few situations that are as horrific as truck accidents. The massive size of tractor-trailers and large commercial trucks means that any accident they are involved in is nearly certain to inflict catastrophic harm on those involved. Understanding this, we provide injured clients and family members of those who have lost a loved one with the compassionate counseling that they need following an accident. The proven negotiation and courtroom strategies that we have honed over many decades of practicing law have allowed us to reach numerous favorable results for clients in truck injury cases and wrongful death lawsuits. This approach also shows trucking companies, insurance carriers and all other liable parties that you will not be forced to settle for less than the full value of your claim. Our team of Boston fatal truck accident attorneys provides those who have lost a loved one in a trucking accident with the guidance and support they need during this trying time in their lives. Our extensive experience in accidental truck death matters allows us conduct intensive investigations, gather witness statements and know exactly what evidence to secure in order to give your case the best chance at success. We take care of all aspects of the legal process, so that you can focus on grieving for your loved ones and taking care of your own emotional well-being. Although a lawsuit cannot bring a loved one back, it holds negligent parties accountable for their actions and shows truckers and trucking companies that irresponsible actions will not be tolerated. In cases involving these and other truck accident injuries, our representation is designed to get you the money you need to live as healthy and normal a life as possible. Were You In A Truck Accident In Quincy, Cambridge Or Another Area In Massachusetts? Contact Us Today. For a free consultation with one of our client-focused lawyers, contact us online or call 617-225-2100.